Will Gordon's horses triumph at Fairyhouse on Sunday? "Apple's Jade is bidding to win the race for the third year in a row... 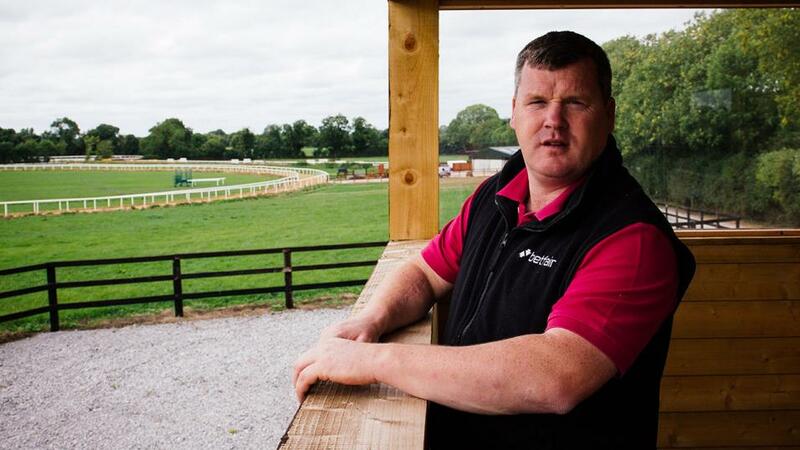 I was thrilled with her effort at Navan a few weeks ago when she won with plenty to spare." Chief Justice has started out well over hurdles and, even though he was beaten at Wetherby last time, I wasn't disappointed as he finished a creditable second to a smart horse of Alan King's. He is going to have a break when the ground turns soft but, while it remains in his favour, I was keen to line him up here. The experience that he has picked up in his three runs so far should enable him to run well. Coeur Sublime is a lovely horse who produced a nice effort to win at Down Royal on his jumping debut a few weeks ago. That was only the second run of his career, and he still has a lot to learn, so hopefully his lack of experience won't catch him out. He has a very nice way of doing things and everything he's shown me at home would suggest that he should be up to holding his own in good company as a juvenile hurdler. He looks to have improved from Down Royal. Can Commander show his class? He is taking a big jump up in class for the Royal Bond and it's going to be interesting to see how he gets on. He's a deceptive horse in that he only does just enough and he showed that he won his maiden hurdle at Punchestown a few weeks ago. I was happy with how he performed there and so was Davy (Russell) so we decided to take a chance and throw him in the deep end. He is coming back in trip to two miles and that is a concern but at least he is dropping back in distance at a fine, galloping track. He's won his point-to-point, his bumper and his maiden hurdle in good style but we should find out a bit more about him this time. The way he won the Land Rover Bumper last April would suggest that he is a potentially high class novice hurdler and I'm hoping he will show that to be the case here. Time for Tintangle to take a big step forward? Tintangle turns out again quickly after winning at Thurles on Thursday. You wouldn't know she ran on Thursday looking at her on Friday morning and she was so well in herself we took a chance and decided to declare her. This race represents a big race in class for her and it's always a worry running a horse back so quick, while slower ground and a longer trip would be better for her. There's a chance she could pick up some valuable black type but even so she will have to step forward. I was a bit disappointed that Blow By Blow was touched off in a Grade 2 at Punchestown a couple of weeks ago. He won nicely first time out over fences at Galway and looked to have improved from that run so I was hoping that he'd take beating. Possibly the way the race worked out didn't show him off to best effect and I do think that the best is still to come from him over fences. He's probably prefer a long trip and easier ground but he still run with credit here. Cubomania has had a terrific few months but just struggled when he moved up in grade last time, finishing fourth in the same Punchestown race that Blow By Blow ran in. That last run leaves him work to do at this level but he will love the ground and the slight drop back in distance will definitely work in his favour so hopefully he will outrun his odds. Delta Work got his chasing career off to a bright start by winning at Down Royal a month ago. I was pleased with his jumping that day, as he was bold at some fences but clever at others, and the experience he picked up over the last three fences that day will really stand to him - they winged the last few fences that day after going steady early on. As a Pertemps Final winner he is going to be at his best over three miles but I think he has enough class to be competitive at this level over this trip and he should run well. I'd also say that he has improved nicely for his Down Royal run. Another strong performance on the cards from Out Sam? Both my horses in this race are going to make a quick return to action after contesting last week's Troytown Chase. I thought Out Sam ran well in the Troytown where he finished well from off the pace. That run followed up his win in the Cork National, so hopefully he's progressing into the sort of horse that we hoped he would become when we bought him. He has plenty of weight to carry here but he will appreciate moving back up to this trip. A repeat of either of his last two runs will see him go well. Rogue Angel faded out of contention at Navan having been up with the pace from early on. Up until the Troytown he had put together a string of nice runs in defeat and he is definitely better than he got to show last weekend. Paul (Townend) looked after him once his chance had gone last week and he came out of that race bouncing so I felt it is worth letting him take a chance back over the course and distance that provided him with the biggest success of his career. I wouldn't be at all surprised to see him run well. Hat-trick win for mare in excellent form? Apple's Jade is bidding to win the race for the third year in a row. As she is a mare that always improves for her comeback run I was thrilled with her effort in the Lismullen Hurdle at Navan a few weeks ago when she won with plenty to spare. Since Navan she has been in excellent form and she looks as good as ever so that being the case I'd like to think that she will make a bold bid to win this race. She has the advantage of a recent run over several of these rivals and that will also help her cause. It will be interesting to see how Farclas gets on as he starts back for the season. He had a wind operation over the summer and has just taken a little time to come to himself but he is in good order and has been going well at home. I'm quite happy to put a line through his last run at Punchestown and before that he showed just what he could do when winning the Triumph at Cheltenham. It's never easy for four-year-olds taking on their elders at this stage of the season, and he lacks the benefit of a recent run, so I would say that he is probably best watched. Dortmund Park badly needed his comeback run behind Apple's Jade, so I'm expecting him to do better this time. But he is now moving up to Grade 1 level. His form and ratings leave him with a bit to find at this level although he's a horse I do like quite a bit and I do feel that the best is yet to come from him. Sutton Place is another starting back for the season after a couple of runs over fences last season. He progressed into a high class staying hurdler a couple of seasons ago and hopefully he will continue to represent us at a good level. He has been off the track for 10 months though, so he will need the run and a longer trip and slower ground would be more suitable for him. I do think that there is a big handicap to won with Brelade but he is another of our runners who is starting back for the season and there will be better to come from him following this run. He has only ever won one race over hurdles but he deserves to have won much more and I think that he will show that to be the case this season. After switching back from fences to hurdles late last season he ran very creditably to finish seventh in the County Hurdle at Cheltenham and he ran better than his final position would suggest when he was fifth in the Scottish Champion Hurdle at Ayr on his last start. He will be very competitive in these types of races throughout the season and even without the benefit of a run he should show up well. Tombstone is interesting. I think off his rating he can be competitive in good handicaps this season and he is probably a better hurdler than a chaser which is why he has done most of his racing over hurdles this season. He probably ran as well as he could do in the Morgiana Hurdle last time and this should be a more suitable test for him. Hopefully he will run well but there are others in the race who are probably open to more progress. Stooshie is a consistent sort who rarely runs a bad race and, in truth, he deserves to have won more races than he has. His last run at Punchestown didn't quite match the level that he had run to on his previous starts this season. We felt after his run that day that he would benefit from moving up in trip. However, he does travel very well in his races and he jumps great too and those are the sort of qualities that could enable him to run well in a race such as this. Envoi Allen is a horse we got after he won his point-to-point very impressively last season. At home he has done everything right and looks like a horse with plenty of ability so it will be good to get him started. He is really a chaser in the making but we will bring him along steadily for the moment and it's right thing to do by the horse to stick to bumpers this season. He works like he should run well in a race like this but I would like to see the ground ease for him. Soldier At War is smart type and I was very pleased with his recent debut second at Punchestown where he may have been a shade unlucky in quite a steadily run race. He is a classy type with plenty of pace and he will enjoy the ground. He should go close.